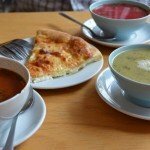 We’ve been on a few food tours now (Scottsdale, Arizona & Prague, Czech Republic) and besides each one obviously having its own obvious culinary flavor, they offer a unique introduction to the city they represent. During our visit to Ljubljana, we joined up with Ljubljana Food Tour for an informative and delicious sampling of Slovenian food. What we enjoyed about this particular tour was that they took us on a culinary journey throughout the country without having to leave the capital city. Each dish we sampled was a specialty dish from a different region. 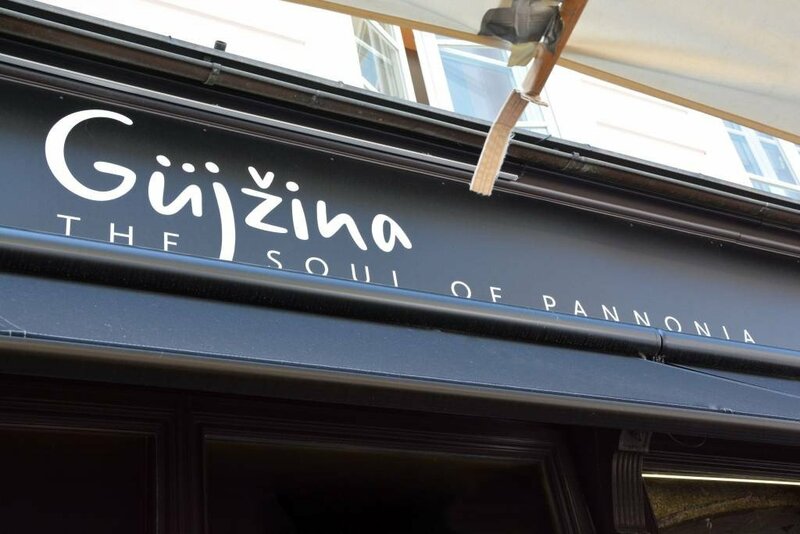 The other great aspect of the Ljubljana food tour was that it wasn’t simply a whirldwind of gobbling down a dish at one restaurant before quickly moving on to the next. We took our time at each strategically chosen destination while our guide, Danijel, shared his passion and knowledge for Slovenia, what has now become one of our new favorite countries! We also stopped at markets and shops along our tour that we may not have known about otherwise, so it was also a great introduction to some of the hidden gems of the city. 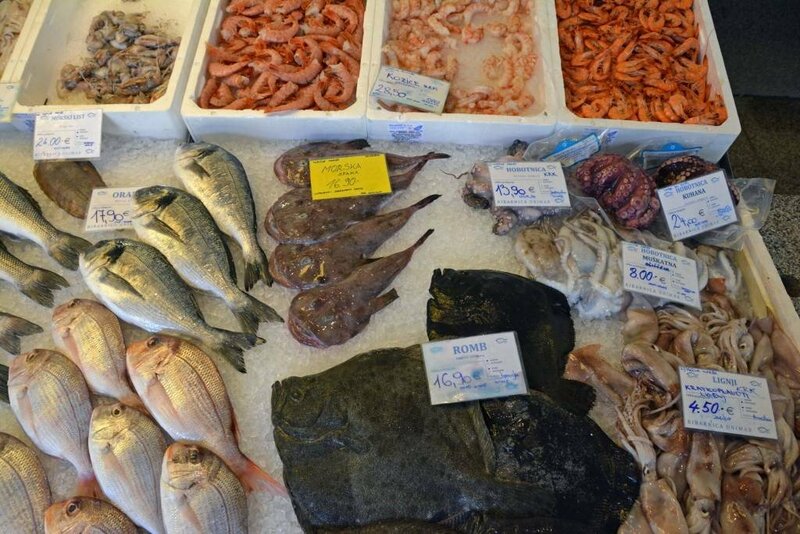 Our first stop was at Ribarnica, the local fish market. 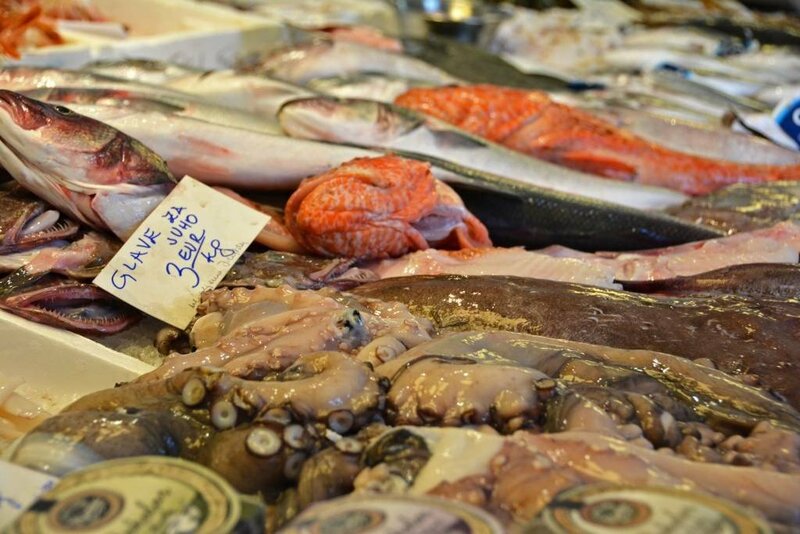 Just down the stairs from the central market, you’ll find an impressive collection of seafood from the shores of Slovenia. Though the country only has 28 miles of shoreline, it is definitely worth a visit. 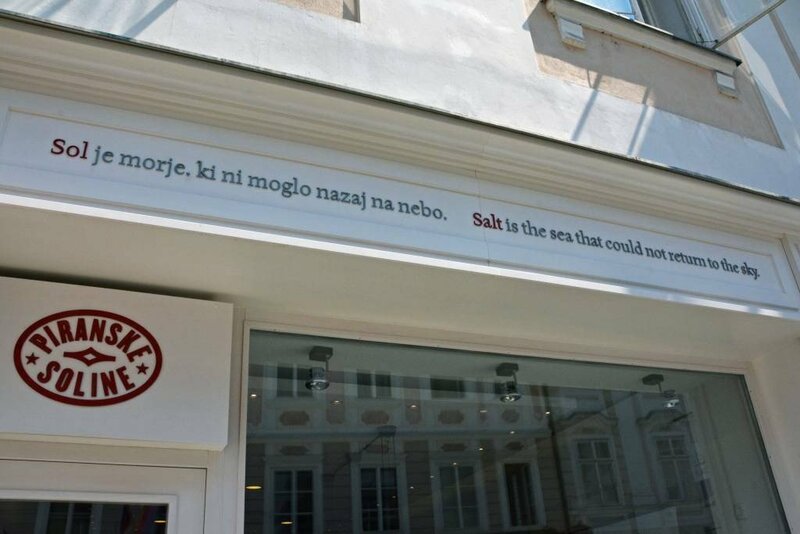 (We went to the seaside city of Piran, just over an hour from the city of Ljubljana.) 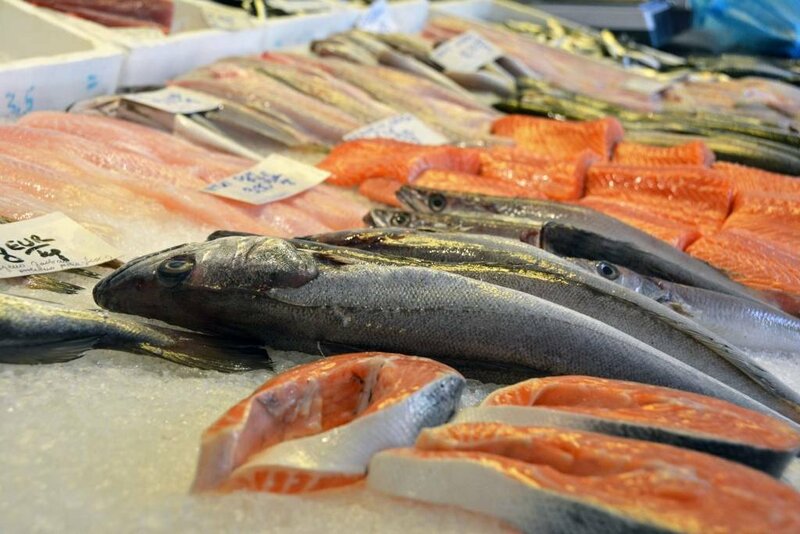 The fish market had an abundance of freshly caught delicacies from the nearby sea. Up the stairs from the fish market was our first restaurant stop- Okusi Istre (Flavours of Istria) where we sampled a delicious bacalar fish pate, along with olives, dried paprika, and anchovies from the Adriatic sea. 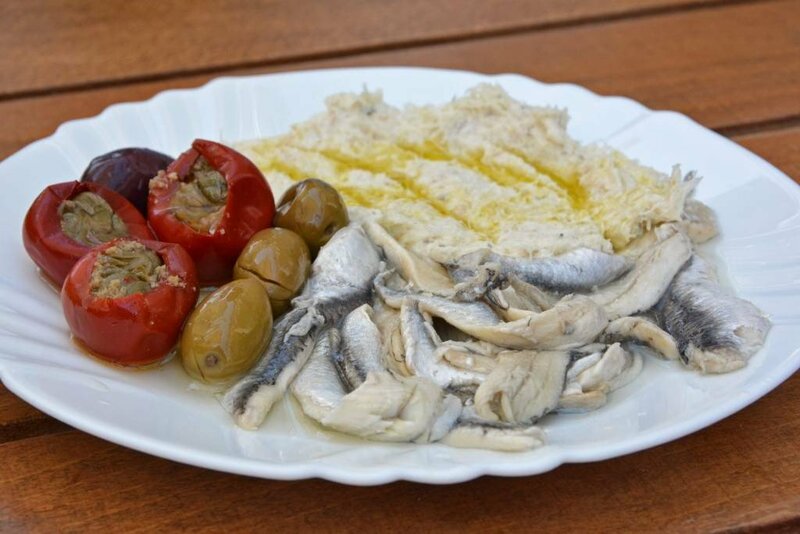 We were feeling adventurous and decided to try the anchovies, a food which, up until now, we had purposely avoided. They weren’t as terrible as we imagined, but now we can say we’ve tried them, and probably won’t need another sampling! We mostly snacked on the yummy seafood pate spread over the fresh bread and sipped on the refreshing white Malvazija wine. Another great thing about this food tour… it was small! It was only us, Danijel, and another nice couple from Germany. Following our first stop, we visited an indoor market which offered fresh bread, meat, spices, and more! The vendors were very friendly and provided us with a few little samples as we wandered through. 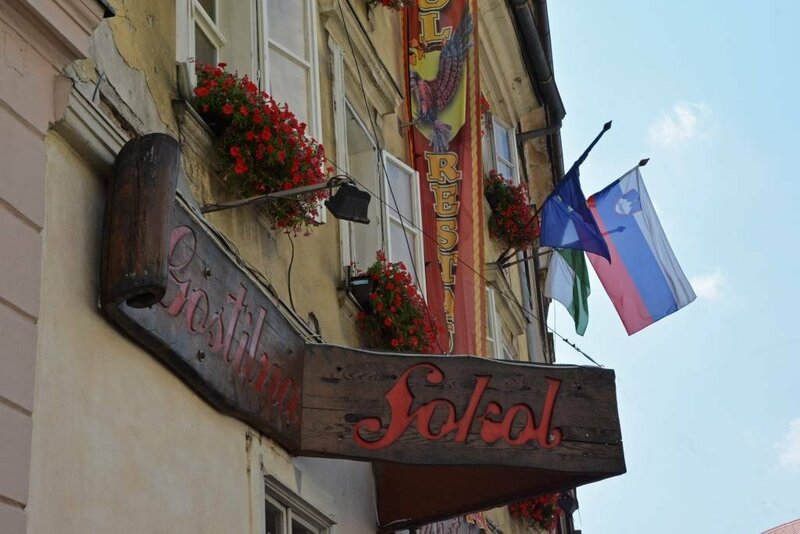 Our second restaurant was one of Ljubljana’s more popular dining establishments- Restaurant Sokol (Falcon). It is popular among tourists because the staff dresses in customary clothing while serving traditional Slovene food and drinks. 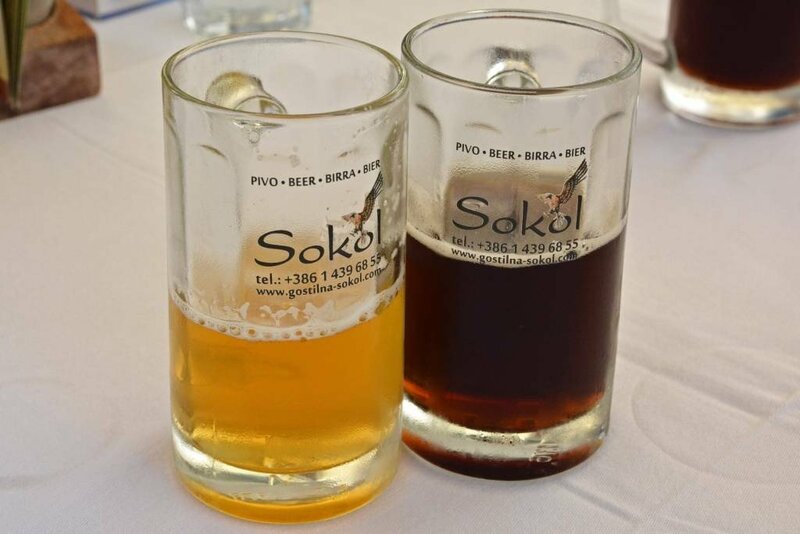 We sipped on homemade Sokol beer, both dark and light. To eat, the group sampled Carniola sausage (pork sausage with bacon) with mustard and horseradish. I let Ljubljana Food Tour know in advance that I did not eat much in the way of meat, and they were more than accommodating. At Sokol, I was prepared a separate dish called loparnica (crèpes with vegetable filling, served with a side of sour cream). It was mighty delicious, but too good and too much to keep to myself, so I happily shared with the group. 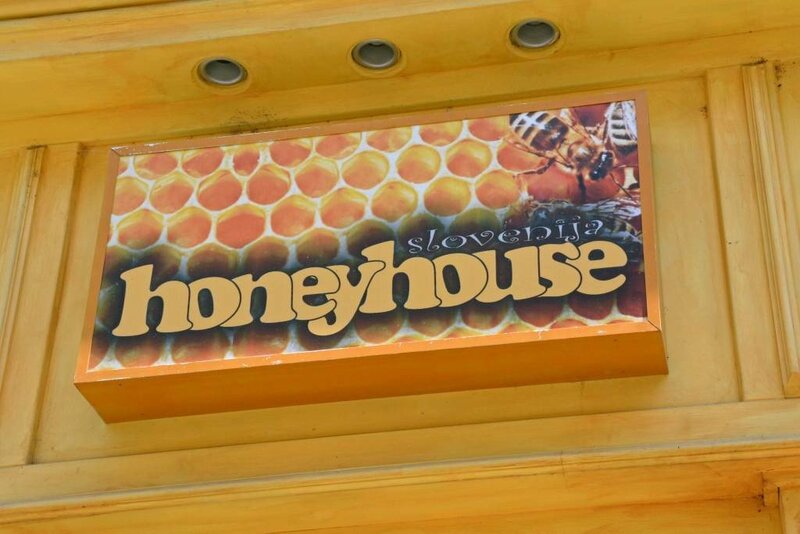 The Honey House offers a wide variety of honey liqueur and different types of honey. 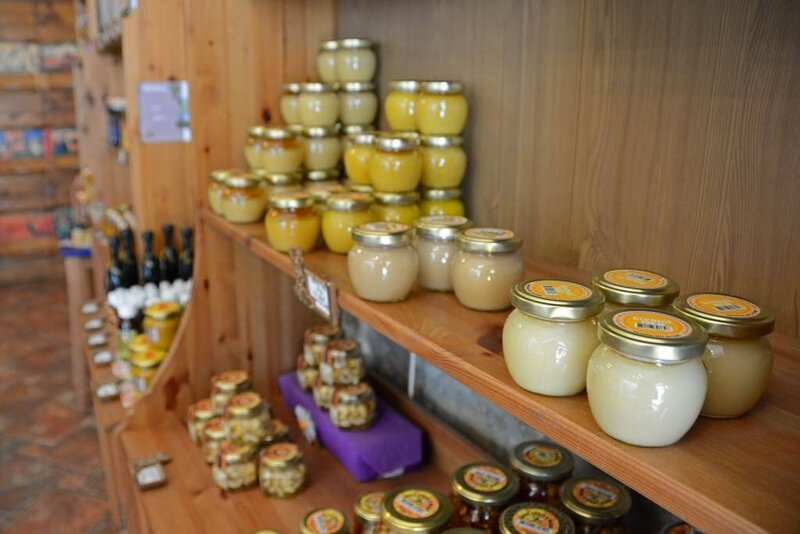 Slovenia has a long tradition of honey making and it all started in the small town of Radovljica, located northwest of Ljubljana, near Bled. We sampled several types of flavored honey and a pretty potent honey liqueur. The vanilla-cinnamon flavored honey is among their most popular. We purchased a jar to take with us because it was so good! 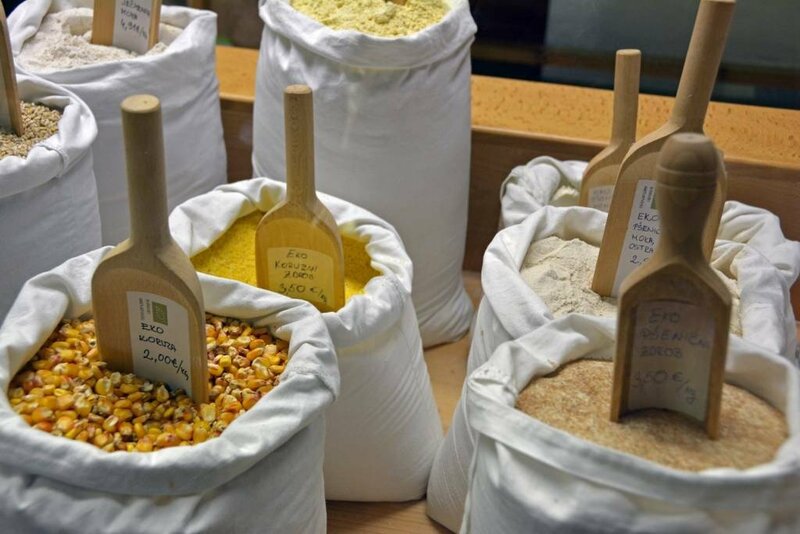 Before this tour, we couldn’t honestly say we’d ever stepped foot in a salt store, but after visiting Piranske Soline, now we can! Salt has been produced in the lovely seaside town of Piran since the Middle Ages. 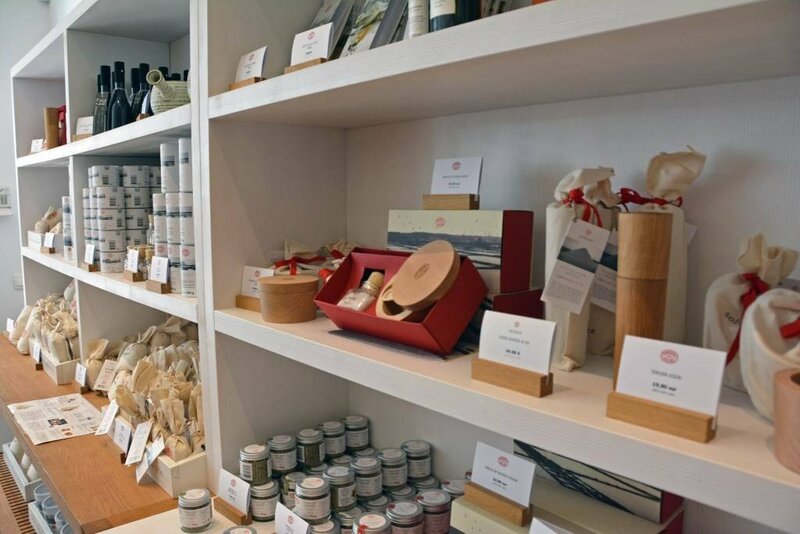 This specialty store sells food and beauty products. We were more than happy to sample the chocolate with salt. Next, our taste buds were transported to the northeast part of the country to sample food popular in the Prekmurje region. 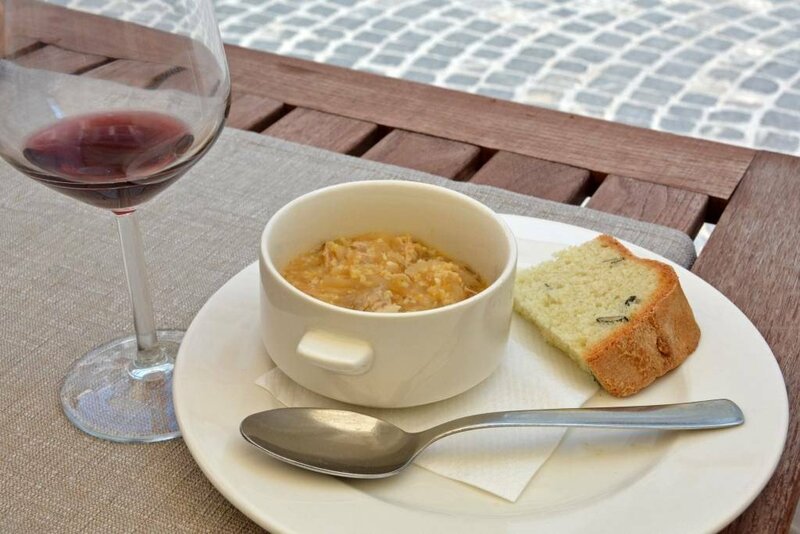 At Gujžina-Soul of Pannonia we ate bujta repa, a dense soup with turnip, onions, millet and pork meat. 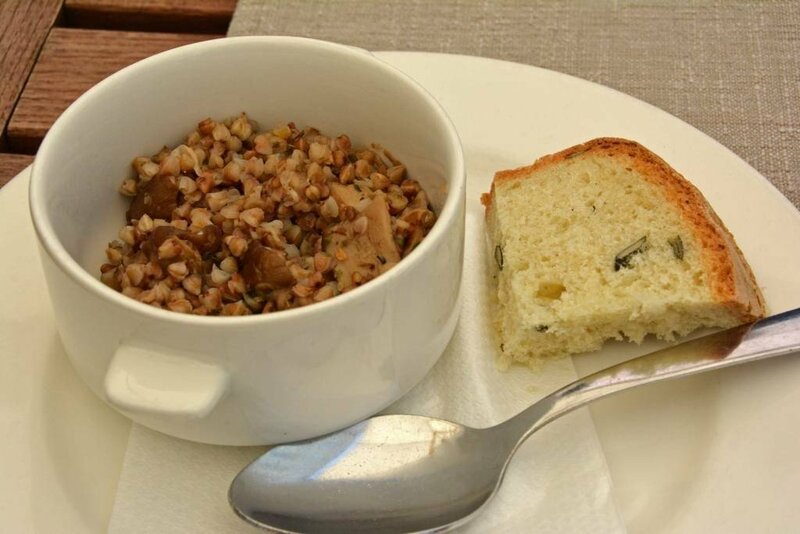 Because of the meat, they provided me with a bowl of ajdova kaša with jurčki (buckwheat porridge with porcini mushrooms), a dish popular in the regions of Gorenjska (northwest from Ljubljana) and Carinthia (north from Ljubljana). Unfortunately, I did not particularly care for this dish, so rather I just enjoyed some red Zweigelt wine from the Prekmurje region. Though we were starting to get full, we still had two more stops. 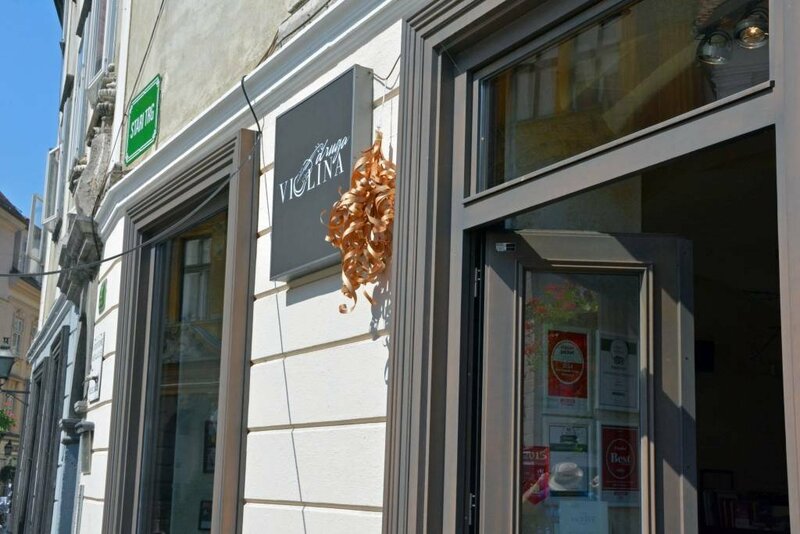 Our second to last was at Druga Violina (Second Violin), an appropriately named restaurant near the Music Academy. 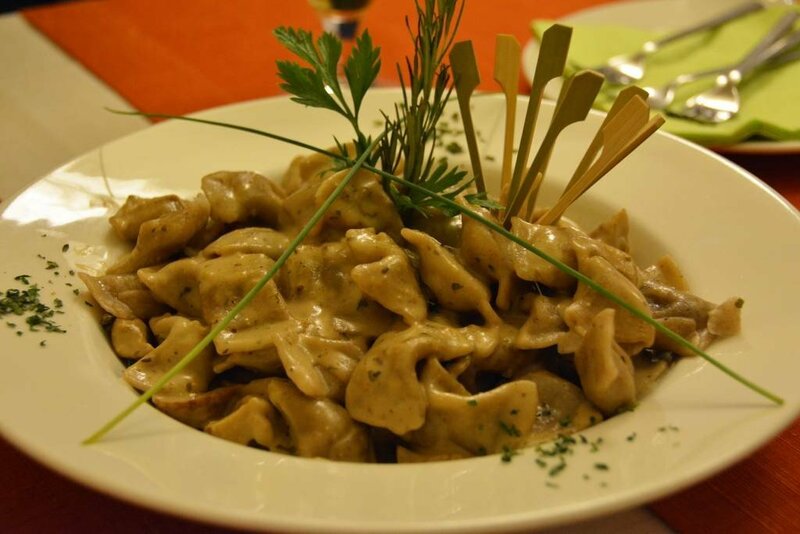 Here we sampled Žlikrofi, a kind of Slovene ravioli or dumpling. Usually filled with meat, Danijel ordered ours filled with potatoes, served with mushroom sauce on top. The flavor was decent, but man, was it dense. Potato dumplings- doesn’t get much more heavy that that! This dish was appropriately popular among the hungry miners working in the town of Idrija (west from Ljubljana) in the past. We also sampled a red Refošk wine and draft Union beer. Union beer is produced in the city of Ljubljana. Representing Northeast Region of Prekmurje…Again! 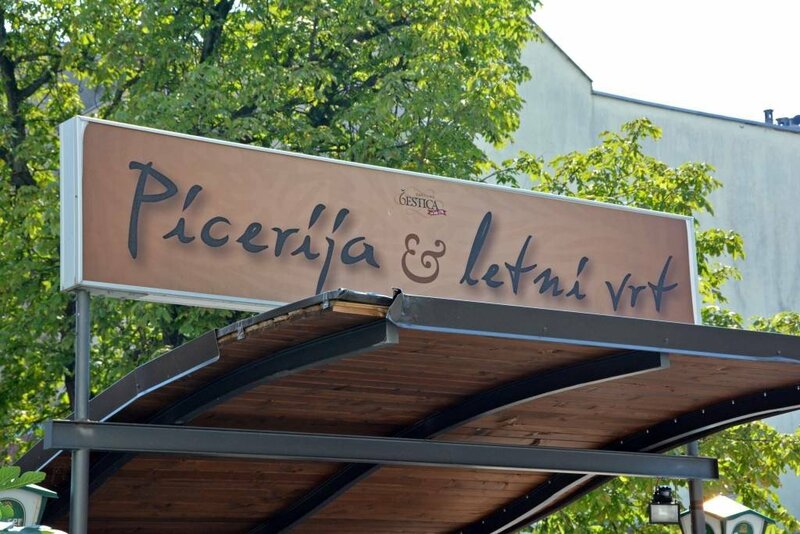 Although native to Prekmurje, the dessert we sampled at Restaurant Šestica (Restaurant Six) has achieved the status of a national specialty of Slovenia. Prekmurska gibanica is a Prekmurian layer cake. The name gibanica comes from the dialectical expression güba and in this case refers to a fold. 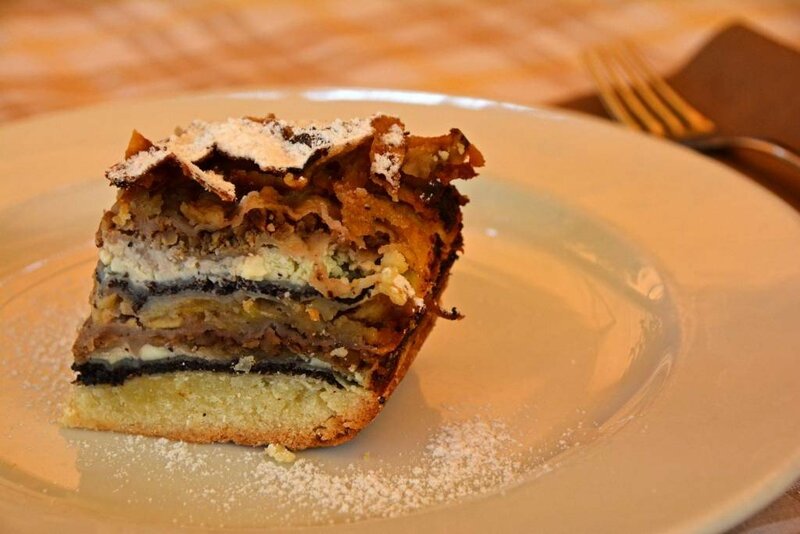 It contains poppy seeds, walnuts, apples, raisins and ricotta fillings… an interesting combination. It’s a dessert that isn’t overly sweet and is unlike anything we had tried before. The American in me wanted a scoop of vanilla bean ice cream to accompany it, but it was just fine as it was! All said and done: 4 hours, 3 markets, 2 specialty stores, 5 restaurants with samplings, 3 wines, 2 beers, a few hundred calories burned from walking, and one heck of a history lesson! 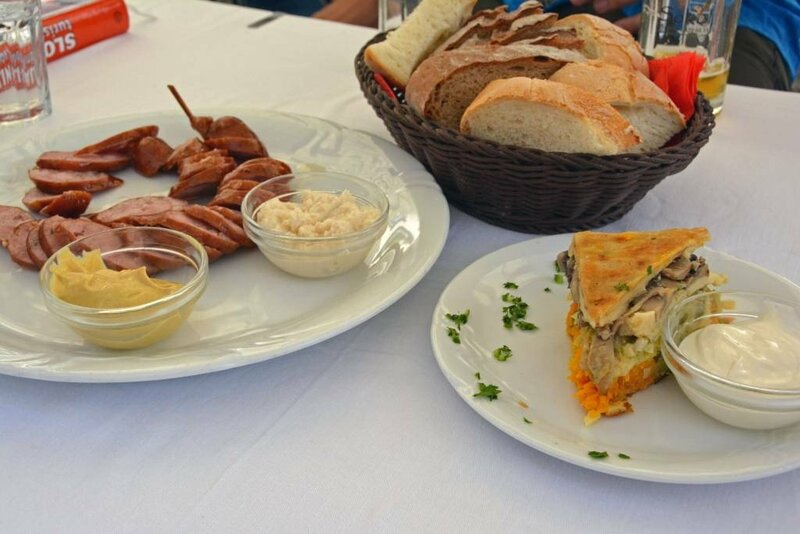 If you’re looking for a great way to explore Ljubljana and get a flavor of traditional Slovene cuisine, look no further than Ljubljana Food Tour. They are highly rated for good reason and we promise you will walk away with a full belly and full of knowledge! Want more information? 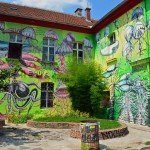 Check out the Ljubljana Food Tour website. Watch a quick video of our time in Ljubljana below! 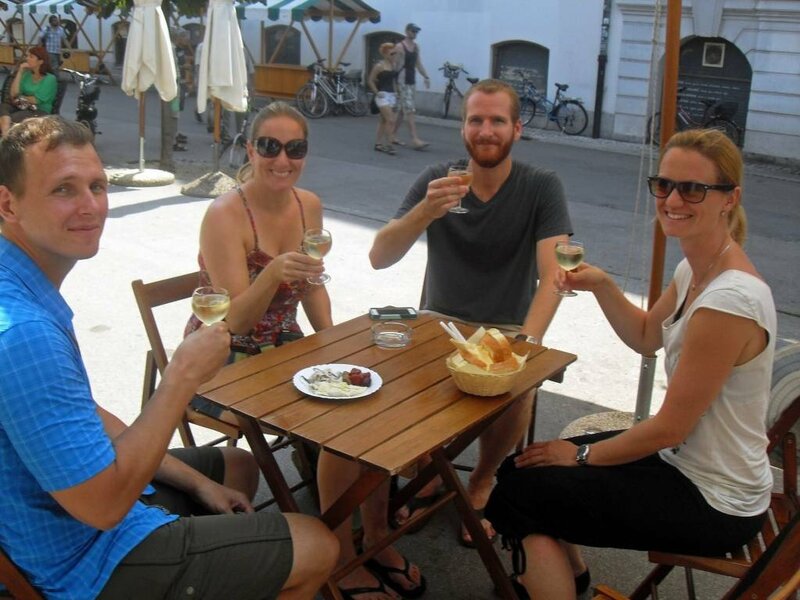 We’d like to thank Ljubljana Food Tour, who provided us with a complimentary food tour, so we could share our experience with you. We’d also like to thank Danijel for being such an excellent and informative guide! All opinions are our own.